This luxurious five-day journey takes golfers on three of Scotland's most prestigious courses - Royal Dornock Golf Club, Castle Stuart Golf Links and Kingsbarns. Embark on the ultimate adventure through the Highlands with Sam Torrance, one of Scotland's most celebrated golfers. Non-players also enjoy a fun-packed itinerary, visiting great Highland attractions such as Glenmorangie Distillery, Cawdor Castle and Culloden Battlefield and St Andrews. Join Scottish professional golfer Sam Torrance as the train pulls out of Edinburgh station in the early afternoon and travels west towards Stirling where it bears north and passes Gleneagles resort heading for the 'Fair City' of Perth. A leisurely afternoon tea is served as you journey along the Highland line through Dunkeld, Pitlochry and Blair Atoll with its imposing castle. Dinner is served as you continue your journey north, passing Kingussie and Aviemore in the Cairngorms National Park and Inverness, before arriving at Tain where the train stables for the night. As your first day draws to a close, enjoy a nightcap with your fellow guests in the Observation Car. After breakfast on board Belmond Royal Scotsman, Sam Torrance will accompany golfers to the Royal Dornoch Golf Club, the most northerly of the UK's championship courses. The timeless setting of this course is what makes it such a pleasing place to play golf. It's wild, isolated and, at the same time, absolutely beautiful; there's the blaze of colour in early summer when the gorse is in flower. The pure white sandy beach divides the links from the Dornoch Firth and it all feels very humbling. Tom Watson, an honorary member of the club, came here in 1981, the year after winning the third of five Open Championships at Muirfield. He had intended to play 18 holes, but instead played three rounds and deemed it "the most fun I've ever had on a golf course". The first eight holes follow the ridge and the remaining ten holes played in the opposite direction are bounded, except the 17th and 18th on the left by the sandy beaches of the firth. Non-golfers can enjoy a day at Dunrobin Castle, the largest great house in the Northern Highlands, followed by a visit to Glenmorangie, the distillery that produces one of the whisky nation's favourite drams. All guests rejoin the train at Tain for an informal dinner and the evening journey towards Kyle of Lochalsh on a spectacular route regarded as one of the most scenic in the world. Retire to the Observation Carriage after dinner for an after-dinner drink and be regaled by Sam Torrance as he recalls some of his amusing and fascinating experiences as a professional golfer. The train makes an early departure from Kyle and retraces its route to Inverness. Golfers disembark to play the new Castle Stuart Golf Links, host venue for the Scottish Open 2011-2013. This is a stunning new championship links course with panoramic views across the Moray Firth from every hole. It is a par-72 course and is 7,009 yards in length. Non-golfers disembark at Nairn for a visit to Cawdor Castle and Culloden Battlefield, site of the last major battle fought on British soil in 1746. In the afternoon, all guests return to the train as it continues on to Dunkeld. Enjoy dinner on board followed by entertainment in the Observation car. Enjoy the views from your window as breakfast is served and the train travels south-east to Dundee. Golfers disembark in Leuchars to play the at Kingsbarns Golf Links. 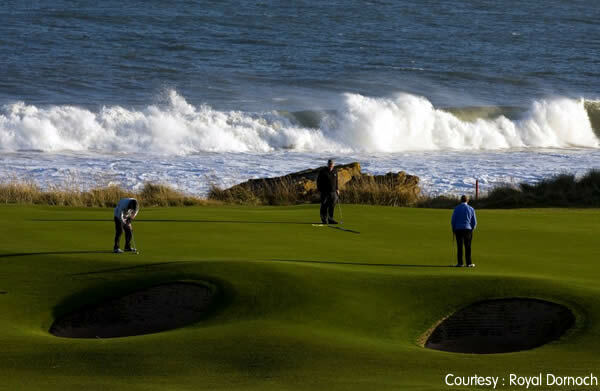 Situated 7 miles from St Andrews along 1.8 miles of picturesque North Sea coastline, where each hole embraces the sea. Non-golfers can enjoy a private tour of St Andrews. All guests rejoin the train in Dundee before travelling south. Prepare for a final dinner on board before heading to the Observation Car for your final evening's entertainment. As breakfast is served, the Belmond Royal Scotsman leaves Dundee and wends its way back through the former Kingdom of Fife to arrive in Edinburgh Waverley station mid-morning where your journey ends. Itineraries and timings shown may be changed for seasonal or operational reasons. Prices are per person and include all table d'hôte meals, all alcoholic and other beverages on board the train, all sightseeing excursions as shown in the itinerary and accommodation on board based on two people sharing a twin compartment or one person in a single compartment.